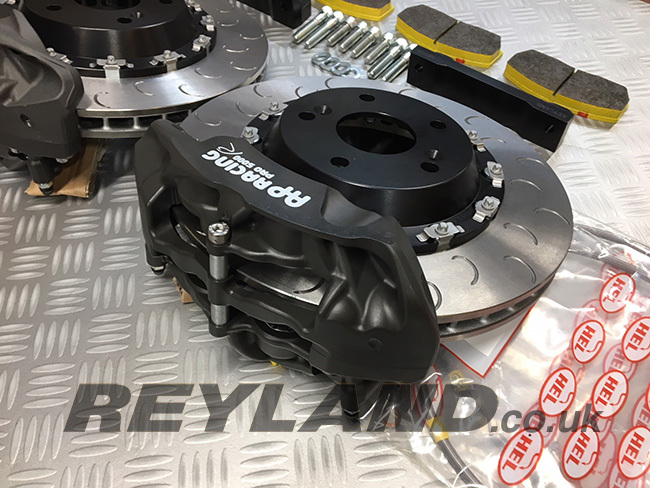 The Reyland Sport front brake conversion features high performance 305x24mm two-piece discs (your original discs are 276x22mm) and Reyland billet alloy cnc machined brackets which re-locate your original brake caliper. The kits are supplied with discs, bells, AP racing disc to bell bolts, brackets and all required hardware, but do not include calipers or pads. This two piece disc kit is designed to be a direct replacement for the one piece discs supplied in the AP CP7611-1000 4 pot kit. The original one piece discs are drilled and are known to crack with hard use, our kit uses precision ground grooved discs with billet alloy bells. Plain disc face is also available if required. The kit is supplied all bolted together and torqued to the correct settings so replacement is a simple as the one piece original. Disc surface options: Straight grooves, curved grooves & J hook. This two piece disc kit is designed to be a direct replacement for the one piece OE discs supplied on the front of a JCW models with the red Brembo 4 pots. Our kit uses precision ground grooved discs with billet alloy bells. Plain disc face is also available if required. The kit is supplied all bolted together and torqued to the correct settings so replacement is a simple as the one piece original. This two piece disc kit is designed to be a direct replacement for the one piece OE discs supplied on the front of a JCW GP2 models with the red Brembo 6 pots. Our kit uses precision ground grooved discs with billet alloy bells. Plain disc face is also available if required. The kit is supplied all bolted together and torqued to the correct settings so replacement is a simple as the one piece original. 1.5kg lighter per side than the OE disc! This floating two piece disc kit is designed to be a direct replacement for the one piece OE discs supplied on the front of a JCW GP2 models with the red Brembo 6 pots. Our kit uses precision ground grooved discs with billet alloy bells. Plain disc face is also available if required. The kit is supplied all bolted together and torqued to the correct settings so replacement is a simple as the one piece original. 1.5kg lighter per side than the OE disc! The Reyland Track 350 front brake conversion features 4-piston AP Racing CP6600 calipers, two-piece 350x30mm discs and Reyland billet alloy mounting brackets and bells. The kit is supplied with all required parts including discs, pads, bolts, brackets, braided brake hoses and unions. Ideal for cars with 18" wheels. Disc surface options: plain, straight grooves, curved grooves & J hook. The Reyland Track 330 front brake conversion features 4-piston AP Racing CP9440 calipers, two-piece 330x28mm Reyland precision ground discs ,billet CNC machined Reyland mounting brackets and bells. The kit is supplied with all required parts including discs, pads, bolts, brackets, braided brake hoses andunions. Fits inside the OE wheel. 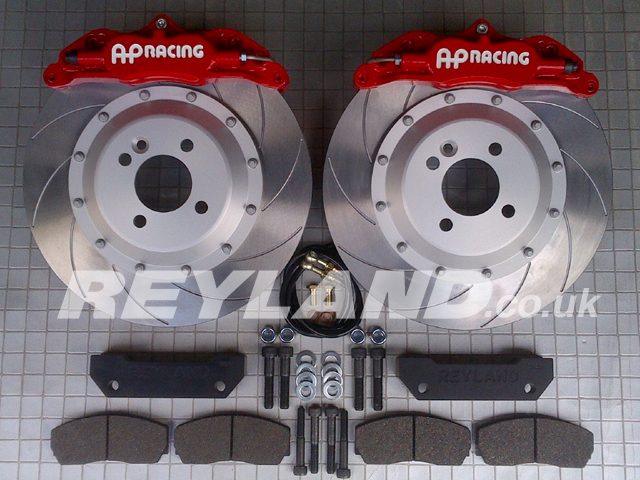 The Reyland Track 330 front brake conversion features 4-piston AP Racing CP9440 calipers, two-piece 330x28mm AP Racing rotors ,billet CNC machined Reyland mounting brackets and bells. The kit is supplied with all required parts including discs, pads, bolts, brackets, braided brake hoses and unions. Fits inside the OE wheel. The Reyland Track front brake conversion features 6-piston AP Racing CP9040 calipers, two-piece Reyland discs and Reyland mounting brackets and bells. The kit is supplied with all required parts including discs, pads, bolts, brackets, braided brake hoses and unions. Please note this kit needs wheels with suitable clearance. The Reyland Track plus front brake conversion features 6-piston AP Racing CP9040 calipers, two-piece AP Racing discs and Reyland mounting brackets and bells. The kit is supplied with all required parts including discs, pads, bolts, brackets, braided brake hoses and unions. Please note this kit needs wheels with suitable clearance.